The event was a true family affair as the late musician's family was in attendance along with musician Frank Russell. Celebrated Chicago bass musician Frank Russell (rear, second from left) is pictured here with the family of late jazz artist Miles Davis, at the dedication of the new Miles Davis U.S. postage stamp. The stamp, officially issued for 2012 by the U.S. Postal Service, was recently unveiled at the DuSable Museum of African American History in the city, as part of a concert in tribute to the late trumpeter coinciding with DuSable’s “The Sounds of History” summer jazz concert series. 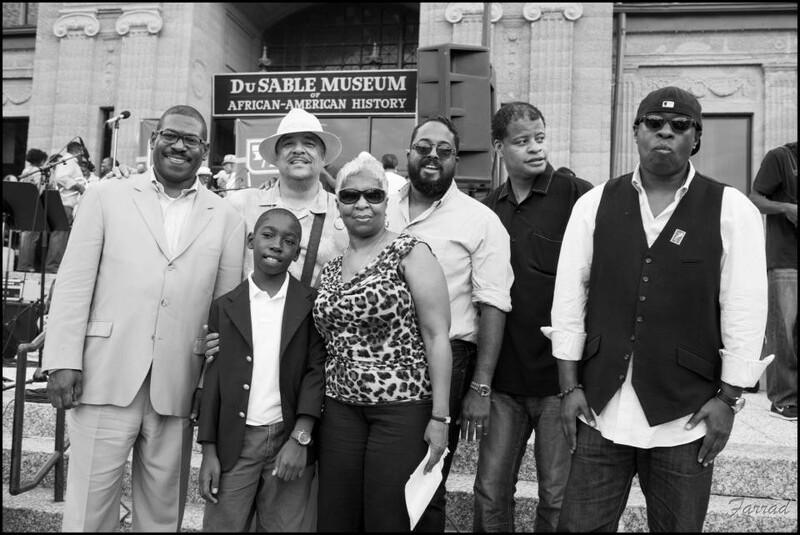 Pictured (front row, from left) are Miles’ grandson Paul, great grandson Paul, Jr., emcee Marsha Noble, his son, Erin, saxophone player Glen Burris, nephew Vince Wilburn and Miles Davis Ensemble percussionist Robert Irving, III. Notably, Irving played on Russell’s current jazz album, 'Circle Without End,' which is under consideration for a Grammy Award. The Miles Davis stamp was nationally released in June, along with a stamp honoring legendary chanteuse Edith Piaf, in conjunction with La Poste, the French postal service. This marked the first time that the United States and France have jointly issued a stamp since 1989, when both countries honored the bicentennial of the French Revolution. Frank Russell’s 'Circle Without End' is available via Amazon.com, on iTunes.com, eMusic and CDBaby.com.